There’s an interesting byproduct of this intense move to the cloud: many cloud-forward organizations don’t have any directory services. As organizations moved to G Suite or Microsoft Office 365, they skipped the directory service. Why? It wasn’t included in their cloud-based solution from Google or Microsoft. Instead of moving forward with the on-prem versions (e.g. Microsoft Active Directory®), they opted to forgo the directory service altogether. This generally works for them for a while. Then, invariably, some unexpected event occurs that makes them realize that directory’s are actually pretty important. A new generation of the solution called Directory-as-a-Service® is making one of its primary use cases the ‘no directory service’ organizations. In the early 2000s, organizations were on-premises and homogeneous. They all used Microsoft Windows and everything was stored behind the firewall, including their servers, applications, and data. When Microsoft introduced Active Directory to be a companion to their email server, Exchange, it made a lot of sense. Directory services was a natural progression for the market leader in enterprise email and productivity platforms. That architecture worked for over a decade and is still in use at many organizations today. As Google Apps was introduced, many smaller organizations made the leap to the cloud. These organizations replaced Microsoft Exchange with a cloud email solution. In many cases, they also were able to leverage the Google Apps productivity suite instead of Microsoft Office. 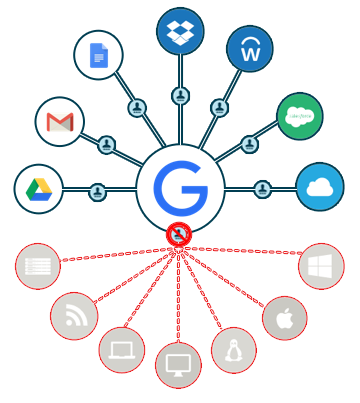 While Google Apps didn’t offer a directory service, they did offer a user management solution for Google tools. If the organization was small enough, they usually opted to forgo the directory service. Installing and implementing Active Directory for a small office wasn’t worth it in their opinion. AD was expensive, hard to install, and required ongoing management. Many of these startup organizations leverage Macs and Linux devices, so Active Directory wouldn’t have been much help anyway. Fast-forward a few years. Now, these organizations are a little larger and have more complexity. In addition to Google Apps, they have AWS, SaaS services, and remote workers. The IT picture isn’t so simple, and they have concerns about how to centralize user management across their entire disparate IT infrastructure. Everything was on-prem and easy to get their arms around a decade and a half ago, but everything is moving to the cloud now. While this is great from a cost and maintenance perspective, it is difficult from a user management and control perspective. IT admins now need to manually manage a number of different user management scenarios, or mini-directories, as we like to call them. This process doesn’t scale and is insecure. In the case where an organization doesn’t have a directory service but is leveraging the cloud via Google Apps, Office 365, AWS, SaaS applications, and more, Directory-as-a-Service is an ideal choice. The directory service moves from being on-premises to the cloud and then also goes cross-platform. Mac, Linux, or Windows devices are all first-class citizens. The unified cloud directory has seamless integration with GApps and O365. Infrastructure-as-a-Service is no problem as the same identities used for GApps or O365 can be used on AWS cloud servers. 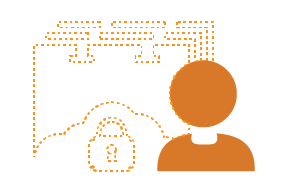 SaaS applications can be connected to the virtual identity provider to enable True Single Sign-On™ capabilities. 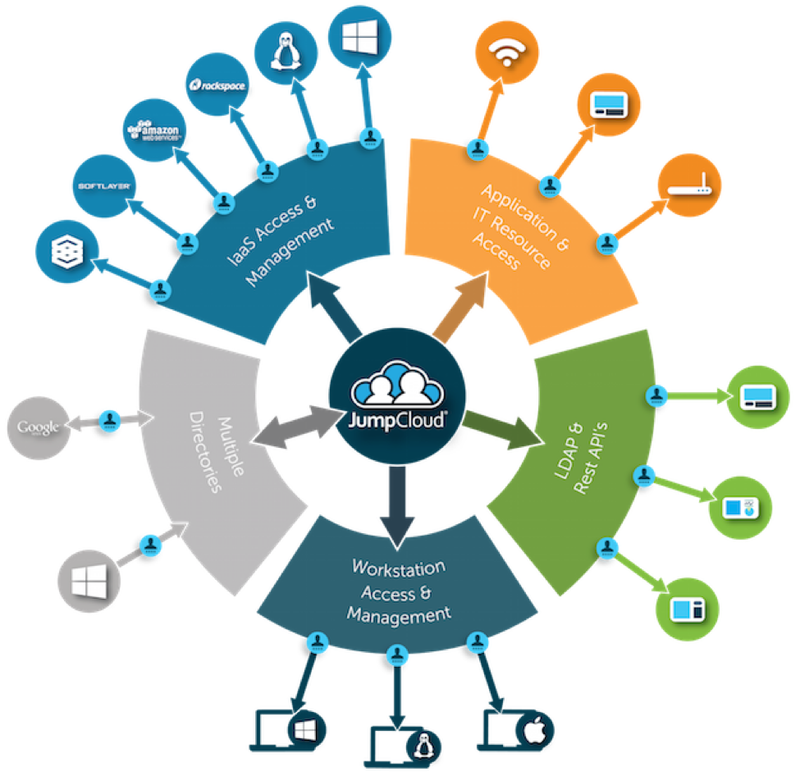 WiFi networks can also be secured via the RADIUS-as-a-Service capabilities of the cloud directory platform. In short, Directory-as-a-Service becomes an organization’s cloud directory that matches the rest of the IT infrastructure and seamlessly integrates. 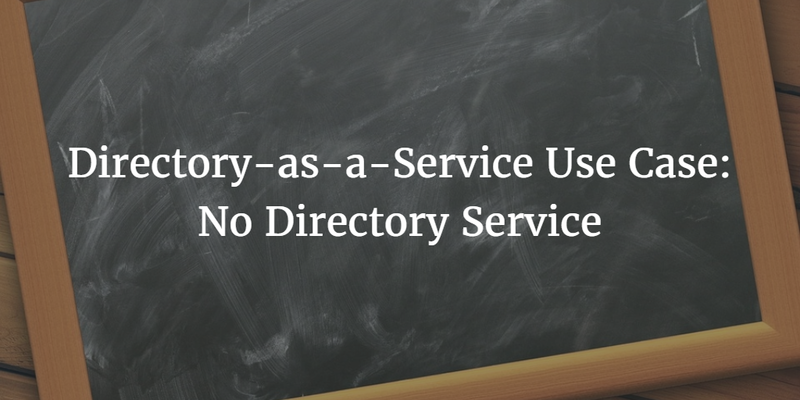 Drop us a note if you would like to learn more about how the Directory-as-a-Service use case of no directory is being solved. And please sign-up for a free account to try the platform yourself. Your first 10 users are free forever. 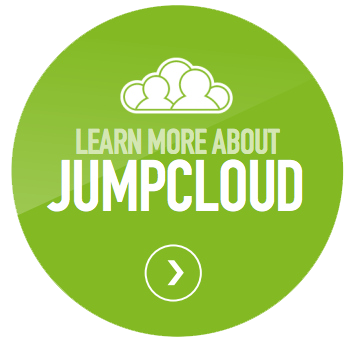 You can also sign-up for our JumpStart program where you can try the Identity-as-a-Service platform from JumpCloud® across your whole organization for 30 days.